NEW YORK/TORONTO (March 8, 2019) – Today, the National Hockey League Players’ Association (NHLPA) and National Hockey League (NHL) announced the establishment of the NHL & NHLPA Female Hockey Advisory Committee, dedicated to accelerating the growth of female hockey in North America while also ensuring more women and girls have the opportunity to experience the benefits that hockey offers. 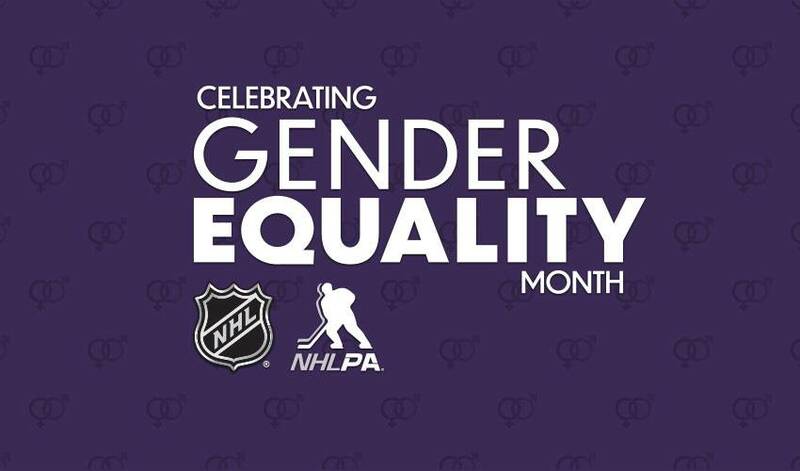 The new initiative launches during the first-ever Gender Equality Month campaign, part of an expanded effort to celebrate Hockey Is For Everyone year-round. The NHL & NHLPA Female Hockey Advisory Committee includes 11 women with varied backgrounds and experiences: Michele Amidon, Annie Camins, Maria Dennis, Mandi Duhamel, Lyndsey Fry, Angela James, Tarasai Karega, Kelsey Koelzer, AJ Mleczko Griswold, Caroline Popilchak, and Kristen Wright. This esteemed group of women has a combined 50-plus years of professional hockey playing experience, 30 years of professional hockey coaching experience, four Olympic medals, and 26 World Championship medals. A mix of Americans and Canadians, they have degrees from esteemed institutions such as Harvard, Princeton, and Yale, with two of the distinguished women holding postgraduate law degrees. The group also represents a series of firsts in professional hockey: the first woman inducted into the Hockey Hall of Fame, the first African-American drafted No. 1 overall in any North American professional hockey league, the first person from Arizona – male or female – to play ice hockey in the Olympics, and the first woman who served in the broadcast booth for the Stanley Cup Playoffs. Throughout March, stories of women from across the hockey family will be shared online at NHL.com/WomenInHockey, on social, and on broadcast. This month, the NHL Executive Suite podcast will include episodes featuring Kim Davis and NHL Chief Marketing Officer Heidi Browning. NHL.com will feature guest columns on ‘What Gender Equality Means to Me’ by Lyndsey Fry, Meghan Duggan, and Blake Bolden as well as ‘Five Questions’ with Brianna Decker. On March 5, NHL Network aired its second-annual all-female NHL Now with Kendall Coyne Schofield, who recently joined NHL Network as a studio analyst. On Saturday, March 9 at 9 a.m. and Noon ET, Schofield, Dani Cameranesi and Gigi Marvin of the U.S. Women’s National Team will be featured in a special ‘Women in Hockey’ edition of NHL Network Ice Time. Also, for the first time, NHL Network will broadcast the Patty Kazmaier Award ceremony, which celebrates the top female college ice hockey player in the United States. The celebration of International Women’s Day is part of Hockey Is For Everyone and Gender Equality Month. Future initiatives include Earth Month (April) and Pride Month (June). Details will be announced at a later date.